Jaguar Land Rover has developed a car-door system that opens automatically as the driver approaches, or can be operated by gesture control. The mobility door prototype, currently being tested on a Range Rover Sport, uses motion sensors and existing keyless entry technology to detect the driver as they walk towards the vehicle before automatically opening the door to welcome them. The company says the technology could help disabled people for whom a car is their main mode of transport; as many as a third of whom report practical difficulties in their daily usage. In addition, it has benefits for those carrying child seats or large items as the driver no longer has to struggle to free a hand to open the door. Radar sensors on the driver's door detect lamp posts or other obstacles to stop the door swinging open and bumping into objects. The door can also be programmed to close and lock behind you as you walk away. The system is a more comprehensive application and combination of technologies that already exist. Automatic locking and unlocking are already in use by many carmakers (the latest BMW X5 unlocks automatically as you approach, for example), while Tesla uses automatic doors with sensors on the Model X.
Jaguar Land Rover is working with a gold medal-winning Invictus athlete to trial its system. 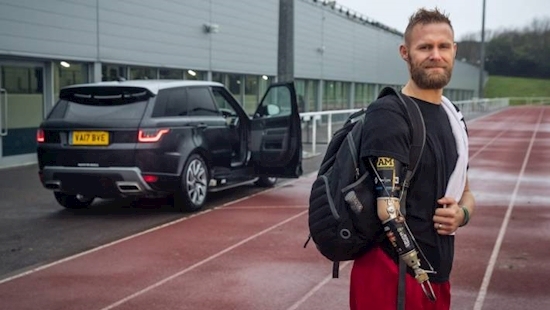 Former Royal Marine Commando Mark Ormrod is Britain's first triple amputee from the Afghanistan conflict. 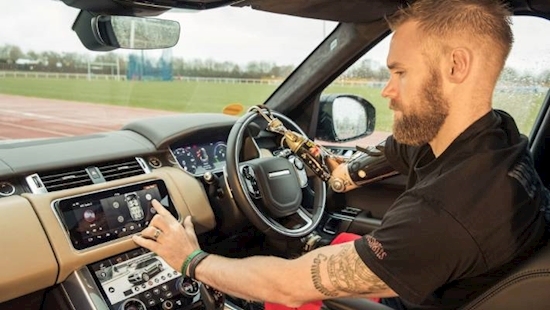 Mark said: "This innovative Jaguar Land Rover technology would be such a benefit to me and has real power to change lives for those who face problems getting in and out of the car. "Opening and closing the car door may seem like such an insignificant task to many people but sometimes it's the small, everyday obstacles which people take for granted that are most frustrating to overcome for those living with disabilities."